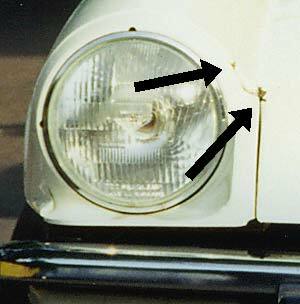 Note the rust around the bonnet lid and the rear seams behind the back wheel. When I bought the car it was generally sound mechanically, but the bodywork had a few rust spots that were obviously going to need a bit of attention – they were especially obvious against the white paintwork. I had decided that I was going to try and do some tasks myself – partly to save money but also as I felt it would be great to work on cars again. So in November 1998 I spent a few days in my father’s garage attacking the rusty bits to prevent any further rotting during the winter. I sanded down to metal and rust-treated all the spots I could find and then added a coat of primer, followed by two coats each of undercoat and white topcoat. Between each coat I smoothed down the paint in the more obvious areas to try and get the best finish that I could. I also sanded down and repainted the wheels with Hammerite silver. I was relieved to discover that most the rust was superficial – the only exceptions being the corner of the boot lid which had a couple of holes that needed filling, and the driver’s side floor pan which had gone through in a couple of places. There was no way I was going to be able to fill that so I rust-treated the rest and had to drive round with a piece of hardboard under the carpet until I could get the floor pan (and sill) replaced! When I’d finished all this, the car looked a lot better than it did before, although I was a bit disappointed that the new paint didn’t exactly match the existing colour. I guess the car had faded after it’s previous respray. After seeing several other Spitfires driving around, it occurred to me that white wasn’t the best colour for the car anyway. It always looked good when I’d just cleaned it, but any dirt would show up really clearly and the areas where I’d touched up the paint did too. So early in 1999, when funds allowed, I decided to get the body seen to properly and to get the colour changed at the same time. The first Spitfire I’d ever seen was in Carmine Red and it looked fabulous so I decided I would like to change the car to that colour. I knew that the restoration was not going to be cheap, but I wanted good value for money so obtained quotes from a number of garages locally – focussing on ones with recommendations from others. DJ Autos of Tunbridge Wells (where I was living at the time) seemed to offer the best value and so we agreed that they should do the work. I surrendered the car for a few weeks whilst they completely stripped it down to bare metal all over. After that they repaired and filled the boot lid and any other dodgy bits they came across, followed by numerous coats of primer, undercoat and topcoat. 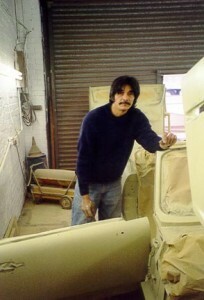 During this time I was preparing to move to West London but I visited the car once when it was in pieces and being primed. It was hard to imagine what it was going to look like when finished. Of course like everything the process overran but eventually the garage contacted me to arrange a date for collection. 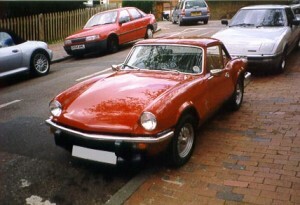 After all this time I can still remember the anticipation and excitement I felt when the day came to pick the car up. Well, the difference was amazing. The car looked as good as new in it’s deep red hue, and I’d replaced the black finishers at the back of the car with chrome ones which really set it off. There was a slight hiccup when driving away as the garage hadn’t put any petrol in the car and the tank ran dry as I was leaving. Pause while someone goes to fetch some more fuel. A few days later Taylor Coachworks fitted a new black soft top and the restoration was complete. At last I could see through the rear window again. With the restoration complete I couldn’t resist driving the car everywhere just to show it off. Anyway, you can see some more ‘before’, ‘during’ and ‘after’ pictures in my photo gallery section. Whilst I was living in Kent, the car was well maintained by my friend Dennis at D & S Autos of High Brooms near Tunbridge Wells, Kent. I believe he has retired now. After I moved West London I entrusted the mechanical care of the car to Mike at Chiswick Car Craft in Chiswick, London W4 (Tel: 020 8994 3395). The floor pan and sill replacement, along with the body restoration and respray were all done by DJ Autos of High Brooms near Tunbridge Wells, Kent (Tel: 01892 511364). The differential rebuild and universal joint replacement were ably done by J W Engineering of Barnehurst in Kent (Tel: 01322 556554). Rimmer Brothers of Lincoln (Tel: 01522 568000). John Hill’s of Alcester (Tel: 01789 400449). TRGB Ltd of Huntingdon (Tel: 01487 842168). And of course Halfords – who were able to supply a lot of the day to day requirements.